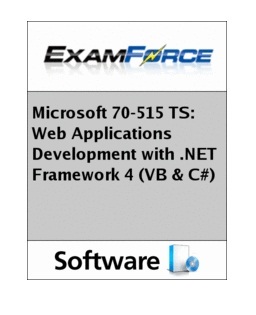 The ExamForce Microsoft 70-515 TS: Web Applications Development with .NET Framework 4 (VB & C#) practice exam provides our unique triple testing mode to instantly set a baseline of your knowledge and focus your study where you need it most. Free Microsoft 70-515 TS: Web Applications Development with .NET Framework 4 (VB & C#) – The MS 70-515 exam is designed to test the candidate’s knowledge and skills for developing Web applications using ASP.NET and the .NET Framework 4. Candidates for this exam are professional Web developers who use Microsoft Visual Studio. Candidates should have a minimum of two to three years of experience developing Web-based applications by using Visual Studio and Microsoft ASP.NET. Candidates should be experienced users of Visual Studio 2008 and later releases and should have a fundamental knowledge of the .NET Framework 4 programming languages (C# or Microsoft Visual Basic).